Thanks to your support, I am 30% of the way towards success at my crowdfunding drive. But with only a week left on the clock, I'm going to need everyone's help if I'm to be succesful. Please visit my page at Experiment.com and consider offering your support! 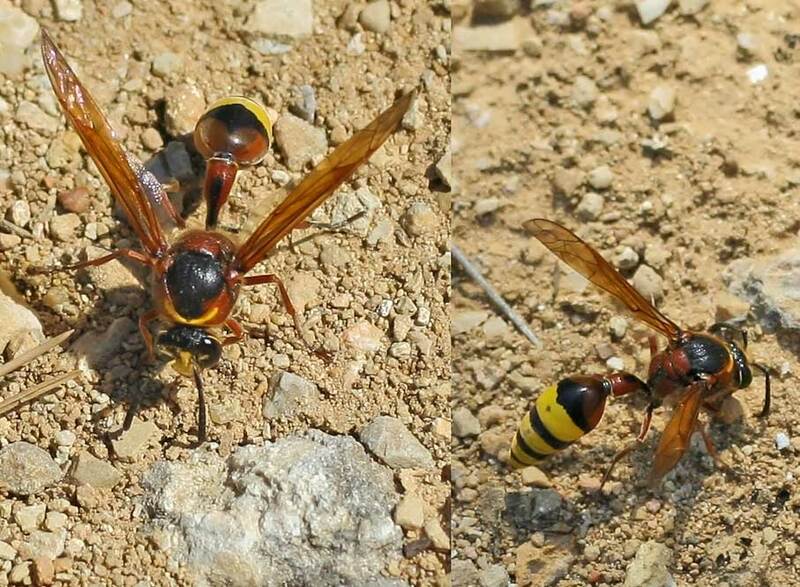 Two views of the potter wasp Delta unguiculata, copyright Entomart. Not so long ago, I found myself struggling with the challenge of identifying potter wasps. 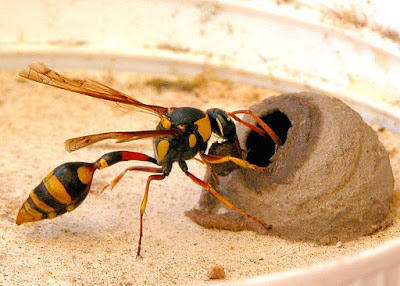 Potter wasps are close relatives of the social wasps, close enough that they are usually classified in the same family Vespidae, but they belong to a distinct lineage (the subfamily Eumeninae) of a more solitary bent, each female constructing its own individual nests in which to lay its eggs. The 'potter' part of their name refers to their preferred material for said nests which are sculpted from mud. 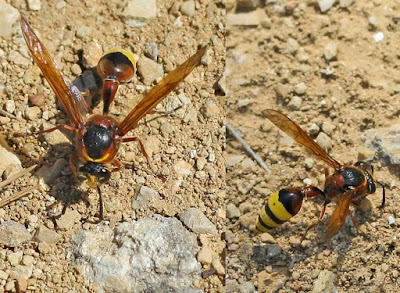 Though they do not form the vexatious swarms that social wasps can, potter wasps still tend to be relatively large and impressive wasps, and like social wasps they are usually strikingly patterned in bold colours to give fair warning of their potentially painful stings. Nevertheless, despite being the sort of thing that would be likely to attract interest, identifying potter wasps can be a definite challenge. For a large part of the twentieth century, eumenine genera were mostly divided very finely, with the features separating related genera often difficult to distinguish. Here in Australia, I found an approachable identification guide for most eumenines to be nigh on nonexistent. One potter wasp genus that I did successfully pull out, however, was Delta. Female Delta campaniforme constructing a nest, from Brisbane Insects. Delta is a genus of about fifty species of potter wasp found in warm regions of the Old World. At least one member of the genus, D. campaniforme rendalli, has become established in Florida after being introduced there from southern Africa (Menke & Stange 1986). Delta belongs to the Eumenes group of genera, in which the first segment of the metasoma (the petiole) is very long and slender. Distinctive features of Delta within this group include the second segment of the metasoma being relatively short with the associated tergum bell-shaped, and the males having the last segment of the antenna bent backwards to form a hook (Nguyen 2015). Females build their mud nests, which they stock with moth caterpillars, cemented to flattened surfaces such as the sides of buildings or along branches. The species introduced to North America possibly arrived in the form of a nest glued to some easily transportable substrate such as a shipment of lumber. The names of Delta and many other Eumenes-group genera derive from the work of Henri de Saussure, who recognised a single genus Eumenes corresponding to this group but divided it into a number of sections that he labelled Alpha, Beta and so forth. Later authors raised these sections to the status of separate genera though some expressed the objection that Saussure may have never intended these alphabetical designations to be formal names at all. The validity of Saussure's 'genus-group names' was eventually settled by a decision of the International Commission on Zoological Nomenclature but authors such as Menke & Stange (1986) have continued to criticise the recognition of these difficult segregate genera, especially as, whereas the Eumenes group as a whole is probably monophyletic, many of its component genera may not be. Future classifications may yet see Eumenes gathering its prodigals back into the fold. Menke, A. S., & L. A. Stange. 1986. Delta campaniforme rendalli (Bingham) and Zeta argillaceum (Linnaeus) established in southern Florida, and comments on generic discretion in Eumenes s. l. (Hymenoptera: Vespidae: Eumeninae). Florida Entomologist 69 (4): 697–702. Nguyen, L. T. P. 2015. Taxonomic notes on the genus Delta de Saussure (Hymenoptera: Vespidae: Eumeninae) from Vietnam. Animal Systematics, Evolution and Diversity 31 (2): 95–100.